The 17th Shangri-La Dialogue (SLD), a multilateral platform on Asia-Pacific defense and security, kicked off Friday in Singapore. 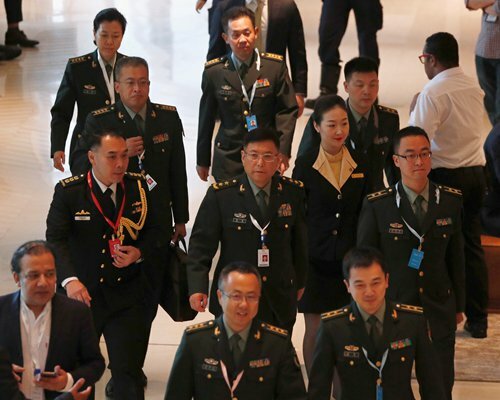 Some 600 delegates, including defense ministers and officials from 40 countries and regions gathered in tightly secured Shangri-La hotel for the three-day event. This year's keynote speech by Indian Prime Minister Narendra Modi pinned high hopes on cooperation with China. "No other relationship of India has as many layers as our relations with China. Our trade is growing. I firmly believe that Asia and the world will have a better future if India and China work together with trust and confidence, keeping in mind each other's interests," Modi said. The remarks were welcomed by Lieutenant-General He Lei, deputy head of the Academy of Military Sciences of the People's Liberation Army (PLA), who leads the Chinese delegation to this year's SLD. He praised the remarks as a friendly and positive gesture when addressing media Friday night. Modi's remarks sent a signal of goodwill toward improving China-India ties, which had been soured by a military standoff last year, Hu Zhiyong, a research fellow at the Shanghai Academy of Social Sciences' Institute of International Relations, told the Global Times on Friday. Modi administration needs improved China-India ties to help it win more votes in next year's election, said Hu. Modi's remarks also create a friendly mood that will help India better engage in next week's summit of the Shanghai Cooperation Organization. "The India factor is what makes this year's SLD different from previous ones," Zhao Xiaozhuo, a research fellow at the PLA Academy of Military Sciences, told the Global Times on Friday. "The Indo-Pacific strategy, and the quasi-alliance between the US, Japan, India and Australia will not last long." Zhao said. On Friday, He Lei held bilateral meetings with high-ranking officers from New Zealand, Singapore, South Korea, Australia and Vietnam and is expected to speak at Saturday's session on strategic implications of military development in the Asia-Pacific region. The mission of the Chinese delegation is to elaborate China's foreign diplomacy and its defensive defense strategy, as well as to show the confident image of China's military, said He. From Washington's labeling Beijing a rival power in its National Security Strategy, to trade spats and Trump's withdrawal of China's invitation to participate in naval exercises, Sino-US relations have witnessed major changes which will be highlighted at this year's SLD. Liu Lin, a research fellow at the PLA Academy of Military Sciences, acknowledged there have been twists and turns in Beijing-Washington ties during Trump's term, but added that the countries "should not lose control or descend into confrontation, and the two countries have reached consensus on this." She told the Global Times that China and the US should take advantage of the SLD to deepen mutual trust and take concrete measures to ensure the smooth development of ties. The anticipated summit between Trump and North Korean leader Kim Jong-un, which could take place on June 12 in Singapore, is another highlight of the SLD, which has allocated 90 minutes to discussion on the denuclearization of the Korean Peninsula on Saturday morning. "Washington-Pyongyang interactions are unlikely to return to the previous mode that featured exchanges of threats," Zhao said. He believes that all countries look forward to the denuclearization on the peninsula as well as Washington's goodwill toward Pyongyang, but added an escalation of tensions could reoccur given the unpredictability of Trump. "The military should be prepared for any emergency. China is happy to see peace on the Korean Peninsula, but has made full preparations for all possibilities and has the capability to prevent the situation from spiraling out of control," said Zhao.